While an excuse is never needed to visit exotic locales, it’s advisable to have an anchor activity for your visit. The Jamaica Jazz and Blues Festival near Montego Bay, was my initial reason for revisiting Jamaica. I had been there decades ago with a group of college chums. Other than the palm trees and azure waters and the natural wonder of Dunn River Falls near Ocho Rios, I don’t remember much. The Jamaica Jazz and Blues Festival is a three night event, held this year at the Trelawny outdoor stadium near Montego Bay. The musical line up of acts was impressive, fun and educational. Reggae is not in my lexicon of favorite musical styles, as the first night was all nominal Reggae from local and regional bands. The second and third nights the caliber of musical entertainment increased with well-known performers including: Mariah Carey, Arturo Tappin, Richie Stephens, Peter Cetera, Charlie Wilson, Pointer Sisters and Soja, who were nominated for Best Reggae Album at the 57th Grammy Awards this year. While many expected Carey to be the highlight of the Festival, it was Charlie Wilson and Peter Cetera who earned the adoration of the music fans. Before and after the evening concerts I visited several Jamaican attractions that offer variety, education and fun. Be sure and plan to visit the restored 1760 Rose Hall plantation house. Here with a personal tour you can step back in time to imagine the lifestyle of a sugarcane plantation owner. The most famous inhabitant was John Palmer’s wife, Annee, who turned out to be called the White Witch by her slaves for her cruel treatment, as she murdered a few husbands and herself was killed in the house. It is said she still haunts the house to this day. While the house was in ruin until in 1965, we are thankful it was completely restored to what might have been its glory days. 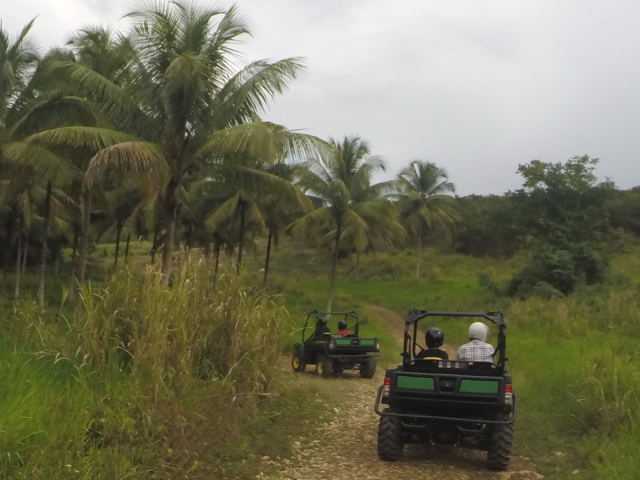 Chukka Caribbean Adventure Tours (www.chukka.com) offers ATVs, dune buggy rides and Zip lining. It is a safe and enjoyable soft adventure to drive a two person dune buggy through the orchards with majestic views of the distance Jamaican mountains. Zip lining is always an adventure, for no two locales are ever the same. As you sit down into your harness and let go, you never know what jungle vistas will be zipping by. Going through the fork of a large tree, is indeed a thrill. The expert guides at Chukka are to be commended for their skill and attention. Chukka also offers, nature canopy tours, river floating and rum tastings. If you can work into your time, visit the great house. The view from atop this hilltop mansion of the Egg Crate Mountains provides a unique memory. 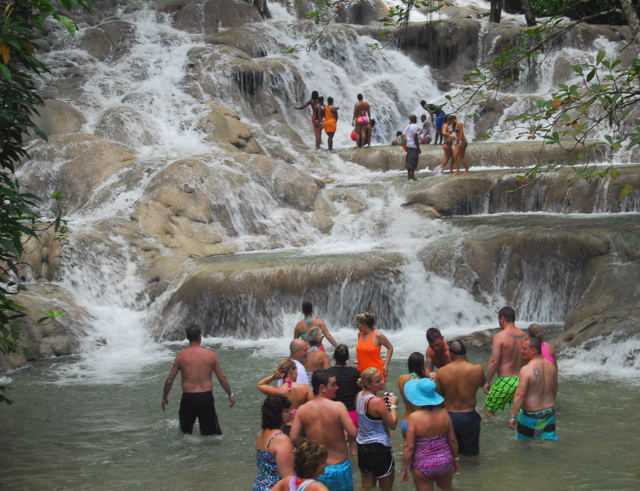 Over in Ocho Rios, be sure and visit Mystic Mountain (www.rainforestbobsledjamaica.com) with its dry bobsledding ride, Dolphin Cove (www.dolphincovejamaica.com) with its sea life and aviary, and it goes without saying to visit iconic Dunn River Falls (www.dunnsriverja.com) . 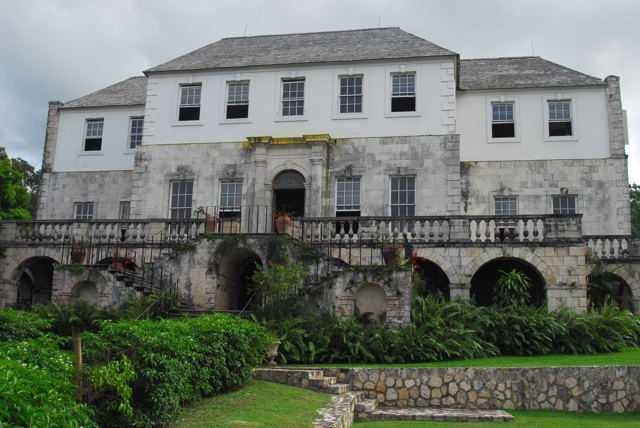 For Jamaican history visit the downtown Montego Bay Cultural Center, by Sam Sharpe square with parking in the rear. In Montego Bay you may wish to stay at the adults only, all inclusive, upscale Hyatt Zilara hotel (http://rosehall.zilara.hyatt.com) with its extensive pools and palm fringed private beach. While I don’t know if it’s officially recommended, but with eight all inclusive (no bills) dining locales, where reservation are not taken, your own impromptu progressive dinner could be enjoyed. What a luxury to sample an appetizer here, and entree at another venue and then dessert at another. Hyatt Zilara offers Brazilian style dinning; Italian, with fresh made oven baked pizzas; an anytime buffet at Horizons, and a favorite of all, the on the beach Jerk stand, with melt in your mouth grilled chicken, port and sausage. Open till 6 pm, a beach side sampling, always hot and ready, is indeed a vacationer’s dream. Beach and pool side servers are available to take and deliver your beverage requests. More eating options are also available along with a Crepe stand near the lobby, operating until 2 pm. And don’t forget 24 hour room service. At Flavorz, I had a Welsh Rabbit, Sunday Roast with Yorkshire Pudding (a pastry), topped off with Jamaican Fruit Cake which is more like a chocolate mousse cake infused with fruit flavors. On my first night I was delighted at the service and ambiance of the dress code-enforced Petit Paris restaurant. Stewart, my server was informative, efficient and personable as he served me scallops, a house salad, Steak Frites and an out of this world Coconut Crème Brule. I added another perfect martini made from the Stirz bar adjacent to the main lobby. Not many bars in the best resorts can make a proper martini or follow directions, but at the Hyatt Zilara, over several days of enjoyable testing, I found them all accomplished. With an evening beverage in hand while strolling along the balmy ocean surf at dusk, you can create for yourself a true lux resort experience.